With years of experience in the material and metal testing industry, Verichek has the knowledge and training power to help you fulfill your quality control needs. Whether it is training staff, providing OES calibration and maintenance, creating procedures, performing audits or providing certifications, we can help you create and maintain quality control. What ANAB Certified Means to You? ANAB is recognized internationally in accrediting organizations to ISO/IEC 17025. Working with an ANAB-accredited laboratory, you know you that the laboratory has consistent operations and produces precise, accurate test and calibration data. The laboratory has consistent operations. The laboratory produces precise, accurate test and calibration data. The laboratory employs highly trained industry experts who meet rigorous technical requirements. Verichek Technical Services, Inc. offers both in-house and on-site ANAB Certified training options, which provide a refresher for basic spectrometer operation. Training is designed to cover the general operation of an instrument along with best practices to ensure operational excellence. They also teach your operators to utilize your instrument to its full capabilities and troubleshoot and conduct minor repairs reducing any downtime of the instrument to ensure accurate test results. PM/Calibration services will reduce the likelihood that your spectrometer will malfunction or provide inaccurate testing data that may cause delays in the quality inspection process. This will also provide security to you and your customers that the products are being produced to the desired specifications eliminating the possibility of any product recall. Having Procedures will help your team and instrumentation run efficiently and lengthen the life of the spectrometer. Verichek can provide procedures for Instrumentation cleanings, Maintenance, Testing as well as troubleshooting and repair. We can work with the end user to develop customer procedures specific to their application. Auditing the procedures to confirm their accuracy and implementation will also add to the effectiveness of your testing methods and streamlining your processes. Verichek can help, as a third-party auditor, review the procedures for your metal-testing instrumentation. Need help with becoming ISO accredited? 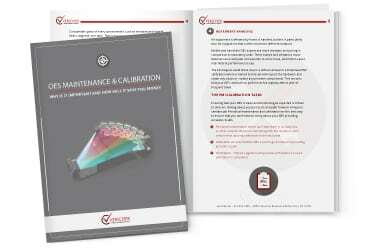 Verichek has been ISO 17025 accredited in Calibration and Testing for over 15 years. We can help set up your facility with the right Work Instructions, Test Methods, and auditing so your facility can become ISO compliant.